I have been fortunate enough to count Berry Bros’ & Rudd, the iconic London wine merchant, as a sponsor of wine-pages.com for a decade now. In that time the company has managed the impressive balancing act of honouring the values and traditions of its 300 year history, with the cutting edge modernity of its web site, smart phone apps and every extending range of services. Likewise, it remains a bastion of Europe’s finest wines, supplying worldwide collectors with the rarest wines of Bordeaux, Burgundy and the Rhône, whilst expanding into new and sometimes surprising regions to bring us wines spanning China to Chile and Cyprus to Canada. To celebrate our 10 year association, I have just tasted through a selection of wines Berrys’ thought particularly suitable for festive drinking, with the promise that if I selected wines for a mixed case, Berrys’ would come up with a very special price for wine-pages’ visitors. N.B. Update 9th January 2014: unfortunately this case has now sold out and the case is no longer available. Please do sign up for wine-pages Newsletter to be the first to hear new of similar offers we occasionally put together for visitors. 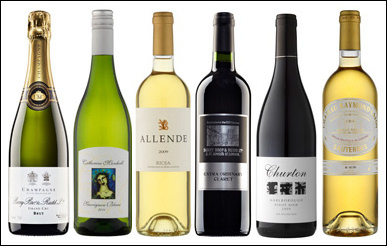 This is a genuinely stunning deal: the dozen wines – two bottles of each wine below – has a retail price of £238.60. Berrys’ are reducing this to £199 for wine-pages, a discount of 16.6%, but if you choose to join their mailing list you will also receive a voucher giving £25 off any purchase over £150 including this case. So the price falls to £174 – an overall discount of more than 27%. What’s more, delivery is free within the UK. These are delightful wines, spanning both the classic regions of Champagne, Bordeaux, Sauternes and Rioja, and two of the New World’s most intriguing terroirs: Elgin in South Africa and Marlborough in New Zealand. The wines do have obvious Christmas appeal, but beyond that (and these are wines that will cellar) they are just terrific wines. I am thrilled to be able to offer this special price, but I make absolutely no commission. Thanks to Berry Bros’ for this offer. Buy the case for £199, or for £174 if taking up Berry’s mailing list offer. All wines below from Berry Bros & Rudd. You know in some ways this is my ‘pick of the bunch’ from this selection. It’s a Champagne that has always been a value for money favourite, but this bottle was just enchanting, made entirely with grapes from the Grand Cru vineyards of Mailly, and with plenty of reserve wines adding depth to the blend, especially those aged in ex-Château Margaux barrels. Miniscule bubbles stream through the rich golden wine, and the nose combines fresh-baked biscuit warmth with saltiness and fat, generous lemony fruit. On the palate the cushion of mousse is sweet and soft, the fruit depth and complexity surprising with nectarine and tangerine fruity brilliance, and that long, long and refined mineral finish. A seriously good little Champagne this and looks very classy too. 93/100. £26.95 (£19.66 equivalent in £174 case offer). The apple and pear orchards of the Elgin Valley are now being overtaken by vineyards, as this cool climate area east of Cape Town gains more and more followers for its classy Sauvignon Blanc, Riesling and Pinot Noir. I have been hugely impressed by the Sauvignons from producers like Iona Estate in the past, but this new name for me has turned in a cracking 2011. There is a tropical, full ripe fruitiness on the nose, but a tugging core of citrus and gooseberry too. In the mouth it is vibrant and zingy, with a flood of fruit that is crunchy and bold, but not at the expensive of texture and a certain dry, savoury, quite mineral quality and enough restraint to make it smoked salmon and – of course – goat’s cheese friendly. 89/100. £11.75 (£8.56 equivalent in £174 case offer). This is Rioja does Burgundy in many ways, a rich barrel-fermented white with its time in small French oak lending a beautifully nutty and gently custardy tone to the ripe but fresh Viura and Malvasia blend. Aromatically it is complex, with touches of sunflower seed and delicate spices, a note of leafiness and a rich lemon and lime rind waxiness. On the palate it has a thrilling balance of cool, citrus and chilled melon precision and more ripe, lightly exotic fruit tones. Acidity is the key here, a rapier blade through the richness and creaminess of the texture. Delightful stuff for smoked salmon or lobster, but has the oomph to be a decent roast turkey choice if white is your thing. 91/100. £18.95 (£13.82 equivalent in £174 case offer). BBRs “Good ordinary Claret” is a consistent best seller and everyday favourite of many of their customers, but this is a real step up. In fact this is an AOC Graves wine, made for Berrys’ by Château Villa Bel Air. It has a delightfully cool and refined nose, briary and peppery, with light ashy earth and a touch of vegetal character, and tight black fruit. On the palate typically earthy and grippy, the barrel ageing adding a touch of smouldering woodsmoke, the berry fruit chunky, but the tannins and acidity giving a savoury, fresh appeal. 88/100. £13.65 (£9.95 equivalent in £174 case offer). English couple Sam and Mandy Weaver specialise in Pinot Noir at their small Marlborough estate, which is farmed biodynamically on a hillside of the Waihopai Valley. Sam describes 2010 as “an excellent growing season” for Pinot, which he makes from whole bunches in open fermenters, and ages 14 months in French oak, only 20% of which is new. The wine has a pleasing pale but youthful colour, and delightfully vegetal and rhubarby notes, a hint of roasting chestnuts and plenty of spice, in a complex layering with earthy red berry fruit. On the palate this is Pinot in a savoury style, the spices are fruity rather than oaky, the tannins fine and grippy and good levels of acidity add to that savoury, edgy concentration. The cherry fruit begins to assert mid-palate, just softening the picture, and the swirl of smokiness from the barrels underpins. Complex stuff that evolves in the glass and will surely age, but has the substance now to take on not only festive roast poultry, duck or goose, but maybe even rare roast beef too. Terrific Pinot Noir. 93/100. £24.50 (£17.87 equivalent in £174 case offer). A full bottle of Sauternes is a decadent treat, and this one is so delicious that somehow three of us polished off almost the whole lot when I pulled this from the fridge at the end of my day of tasting. With almost a decade under its belt this shows barely a sign of development. The nose is all classic baked apple pie, marmalade and delicate tea and tobacco notes. There’s a little floral lift too, before a palate that is just flooded with deliciously sweet fruit. Opulently rich but medium-bodied and retaining excellent freshness, a herby tone helps cut the sweetness, but cannot dampen the enthusiasm of the buoyant tangerine and barley sugar sweetness and generosity. Sumptuous stuff on its own, but matched to all but the sweetest desserts it would be an absolute winner too. 92/100. £23.50 (£17.14 equivalent in £174 case offer). Berry Bros & Rudd.